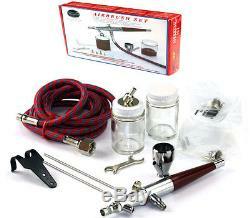 Paasche VL SET Double Dual-Action Siphon Feed Airbrush Kit Hobby Cake VL-SET. Brand New in Factory Packaging. In Stock Ships Within 24hrs. 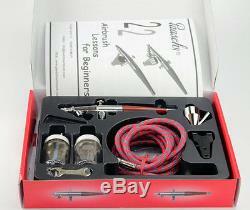 Paasche VL-SET Airbrush Set (Double Action Internal Mix). 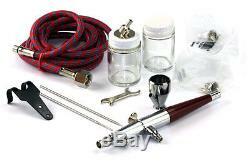 This is the Paasche VL-Set Air-Brush Set. Ideal for a Wide Range of Applications. Rocking Finger-Lever Allows Simultaneous Control of Air and Color Intensity. Constructed of Polished and Chrome-Plated Brass. Components Made of Nickel-Silver, and Needles of Stainless Steel. Different Size Tips, Air Caps and Needles are Quickly Interchangeable. One (VL#1L) Double Action Airbrush. One (VL-¼oz) Color Mixing Cup (metal). One (VL-1oz) 1oz Bottle Assembly. One (H-99) 1oz Bottle & (H-191) Cap. One Each: VLM-1, VLM-3, VLM-5 Multiplehead (includes aircap, aircap body, and tip). One Each: VLN-1, VLN-3, VLN-5 needle (For needle and multiplehead, 1 is for light/ thin paint and precision work, 3 for mid-range, and 5 for heavy paints or broader areas). One (A-1/8-6') Six Foot Air Hose. Pressure Range: 20-35lbs (depending on desired effect). Please note: I will not put less amount on custom papers, so please don't ask. You can return any item in Brand New/unopened condition (within 14 days). Please request for an invoice. The item "Paasche VL SET Double Dual-Action Siphon Feed Airbrush Kit Hobby Cake VL-SET" is in sale since Sunday, March 23, 2014. 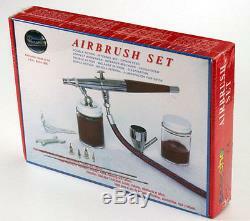 This item is in the category "Crafts\Art Supplies\Airbrushing". The seller is "power_hobby" and is located in Mahwah, New Jersey. This item can be shipped to United States, to all countries in Europe, to Canada, to Japan, to Australia.